With SpeakToText 2.0, you can dictate and copy text to almost any application. You can even speak and send chat messages all without touching your mouse or keyboard. Our specialized WAVE to text feature allows you to convert a WAVE file into text. And as we keep improving SpeakToTextâ€™s update feature finds and installs updates automatically. SpeakToText 2.0 gives you much of the functionality of expensive speech recognition products at a fraction of the cost. 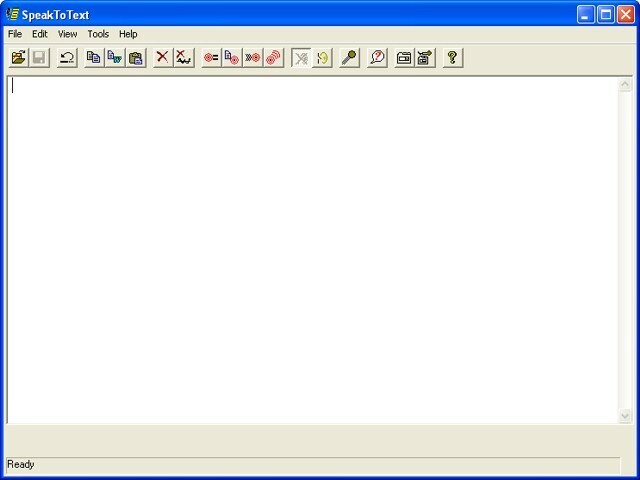 SpeakToTextâ„¢ 2.0 lets you dictate and copy text to almost any application, including most popular chat programs, email clients and even Microsoft Word. Now, you can write letters, term papers, emails, chat messages and many other things just by speaking to your computer. You can even control the program and many of its dialog boxes by speech, and dictate directly into some programs. This feature packed program includes the following features. Copy text to Microsoft Word entirely by speech. Dictate directly into some applications. Compose and send chat messages entirely by speech. Works in AOL Instant Messenger, Microsoft Messenger, Yahoo Messenger and ICQ. Detailed Manuals and How-to Videos to help you learn how to set up and train speech recognition and use SpeakToTextâ„¢ 2.0 to help you get the most out of using speech with your computer. Update feature lets you check for updates. When SpeakToTextâ„¢ 2.0 finds an update, it automatically installs it for you. Speech recognition technology from Microsoft.